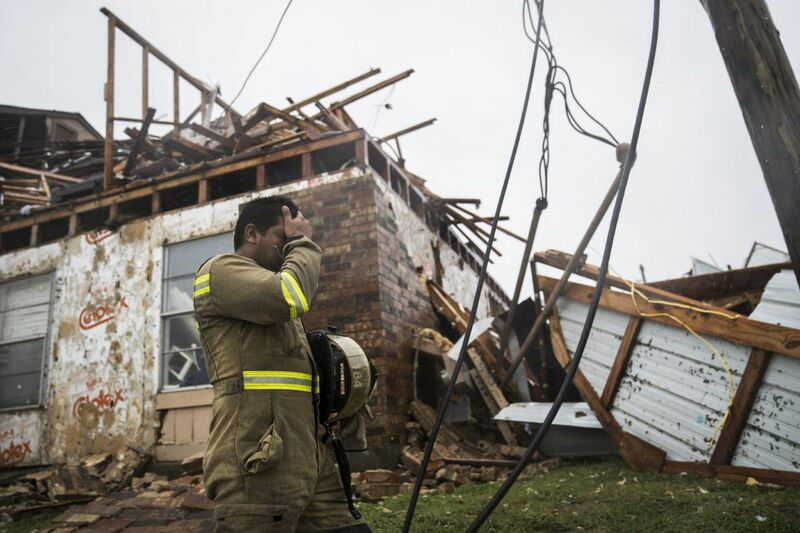 A firefighter wipes his face as he searches for survivors at an apartment complex in Rockport, Texas. We do not legislate our losses. We do not look for them. They come. They can erupt from nouns: war, sickness, weather, fire. They can be experienced as verbs: betrayed, invaded, shattered, crushed. They can be personal, particular, and particularly devastating. They can be headlines summoned by TV crews and overhead drones and far-off strangers answering questions. We may see loss coming — a diagnosis, a forecast, a circumstance, a risk — and we may steel ourselves, gather our provisions, and find a temporary shelter. But who is ever ready for the things loss does to us? We are wrenched, exhausted, and perpetually vulnerable in its aftermath. Last weekend, a monster named Harvey, a Category 4 hurricane, spun toward southeastern Texas and then — enraged, engorged — transformed into a relentless tropical storm. Those who left in advance of the winds and deluge had to choose what more (beyond their homes, beyond their streets, beyond ordinary life as they knew it) they would leave behind — what they were willing to lose. Those who remained, because they believed themselves to be on higher ground or because they had been told to stay, had to pickax their way out of their own attics and raise a flag or call for help on phones with diminishing battery power. They had to hope for rescue. They had to wait for it. Some are waiting still. And all of this, we are told, is just the start. There is more weather, there is more loss, to come. I was watching Harvey on TV when my father called. I was remembering footage of Katrina and Sandy. I was sitting in my dry house on my dry street on a pretty day, the breeze blowing through, and I was trying to transport myself to Texas so I might somehow show my solidarity with the millions under siege. "I have some sad news." "Christopher Allen has died. He was embedded with the rebel forces in South Sudan. They took fire." American freelance photojournalist/writer Christopher Allen was killed last Saturday while covering the fighting in South Sudan. It took me a moment to dial out from Harvey, a loss of epic proportions, to focus on the death of one — a 26-year-old young man I'd met on a train years ago while traveling into the city to teach my memoir class at the University of Pennsylvania. We'd had a conversation, Chris and I, about life stories and about how many lives we get to live, and I'd been so moved by this young man's questions, so frankly challenged by them, that I wrote the scene into Handling the Truth: On the Writing of Memoir. Then I left Chris, I thought, on the page. But not long after that book was published, I learned Chris was the son of my father's friends and that he'd left the safe harbor of his home to travel the world as a reporter. Chris was interested, he later wrote in the Pennsylvania Gazette, in places "where humanity is at its most exposed and raw." He discovered, he wrote for Vice.com, that "Life on the front line is an existence lived on the edge of death; with the proximity of one's own mortality seems to come the climax of many of life's most stimulating experiences — fraternity, adrenaline, adventure, survival, purpose." I'd talked to Chris between his wars, when he came home, about memoir, publishing, life journeys. I'd talked with his parents about concern and hoped-for safety. He was young. He is now gone. "It makes me think of last year when my co-worker passed," he wrote. "Though I saw him every day in the office, I didn't get to know him very well … until after he passed. Then, several people speaking at his wake told different pieces of his life story. This gave me closure because I felt that, though our co-worker was gone, his story had come alive. And that is the same for Christopher Allen, a talented journalist whose stories can help change the world." Singular losses, I thought. Sweeping ones. Not one of us is immune, and all of us are responsible, in the aftermath, for making room for the pain, for reckoning with the hurt, for empathizing and remembering, for doing what we can, where we can. Sometimes the ruin is far away, and we send money. Sometimes it is close, and we motor up our boats. Sometimes it is personal, and we find a way not to finally lose what seems so finally lost. I turn again to my father, for lessons on how. My father, who, after my mother's passing, his greatest loss, built a garden at her grave (he tends it patiently still) so that it may be a place of individual beauty on an individual hill. I think, too, of how my father, wishing also to keep my mother near, endowed a lecture series in her name at her alma mater, Villanova University. So that, once each year, the Villanova Room at Connelly Center swells with students, faculty, strangers, friends — and conversation about the lessons history brings. So that, once each year, it is my mother near — her absence a presence and a reminder that there is not just loss in the aftermath of loss, but the possibility that we might be our strongest when we gather in places where stories get told, where we, together, search for meaning in the past. Beth Kephart is the author of 22 books, including the memoir workbook "Tell the Truth. Make It Matter." She can be reached at junctureworkshops.com. The Lore Kephart '86 Distinguished Historian Lecture Series will be held at 7 p.m. on Sept. 26, at the Connelly Center, Villanova University. Craig Harline will speak on the topic "A World Ablaze: The Rise of Martin Luther and the Birth of the Reformation." The event is free and open to the public.